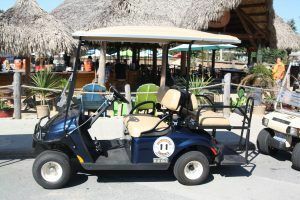 The Put-in-Bay Condos are the most luxurious lodging on the island, and they’ve got golf carts to match! 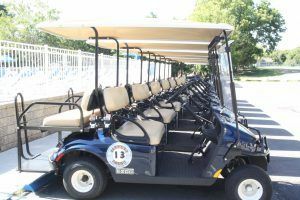 In conjunction with the Island Club, the Put-in-Bay Condos offer brand new 2018 gas-powered carts for rent exclusively to their guests. This cart will look fantastic parked outside of your Put-in-Bay Waterfront Condo! Everyone rides a golf cart around Put-in-Bay, it’s one of the things the island is most famous for. We like to think that if you’re going to join in and ride one, you’d like to ride the best one! That’s where Put-in-Bay Condo Golf Carts comes in. These 4- and 6-person carts are so clean you’d think they just rolled off the assembly line. And they’re powerful too. Gas-powered to give you that extra bit of oomph when you need it. Don’t be surprised if you have people asking you where you got your awesome golf cart. And we’d love it if you told them! Remind them that next time they come to the island they should stay at the Put-in-Bay Condos, and then they too can use one of these amazing carts! Of course, what else would you expect from the Put-in-Bay Condos. They’re going to have incredible carts, because it’s an incredible place to stay! The views from the Waterfront Condos will absolutely blow your mind. It’s the best view on the island. You can enjoy your morning coffee or a meal from your private balcony watching the waves lap in on Lake Erie. Then turn your attention poolside for lunch on the grill and a swim in the famously fun Put-in-Bay Condo Pool. All of this AND the best golf carts on the island? What are you waiting for? Check out our Put-in-Bay Condos page and call 216-898-1105 if you’re ready to book for your preferred dates in 2019!